Do you know that the combination of Red, Black and White is known as the Powerful Color Scheme! I wondered why it is so and as expected Google had the answer. Red is traditionally used as a symbol of good luck, happiness and joy in the Asian Culture. Hence it is often selected for festive occasions like wedding ceremonies and also during the New Year’s holiday. Since red is representative of vigor and fire, decorating your home in Red is equally powerful for drawing positive energy. Black and White provide the complementary balance and unity of dark – light in a living space. 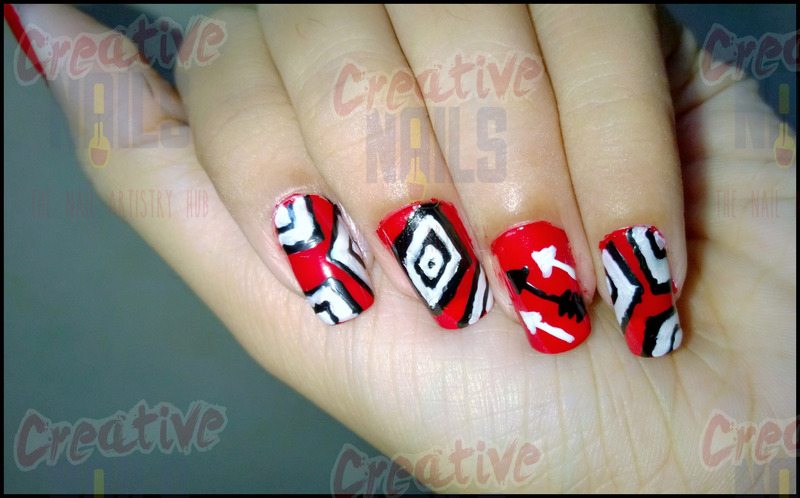 Creative Nails has this time decorated nails with red, black and white! It is looking awesome isn’t it? ← Stained Glass Nail Design! Beautiful. I liked the color combo. Love this post. This nailart is beautiful and eye catching. Red is my favourite color!! Bt i dint kno it was such a positive one..!! The design is really cool! Good job!